The Canary Islands are a Spanish archipelago which, in turn, forms one of the Spanish Autonomous Communities and an Outermost Region of the European Union. The archipelago is located just off the northwest coast of mainland Africa, 100 km west of the disputed border between Morocco and the Western Sahara. The sea currents which depart from Canary's coasts used to lead ships away to America. The islands highest to lowest are: Tenerife, Fuerteventura, Gran Canaria, Lanzarote, La Palma, La Gomera, El Hierro, Alegranza, La Graciosa and Montaña Clara. Tenerife is its most populous island with approximately one million inhabitants; the island of Gran Canaria is the second most-populous. It also enjoys sub-tropical climate with longer hot days in summer and cool in winter. The status of capital city is shared by the cities of Santa Cruz de Tenerife and Las Palmas de Gran Canaria, which in turn are the capitals of the provinces of Santa Cruz de Tenerife and Las Palmas. The third largest city of the Canary Islands is San Cristóbal de La Laguna (City World Heritage Site) on the island of Tenerife. 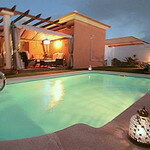 Casa Jacob is a villa set within the village of La Capellania on the outskirts of the popular tourist resort of Corralejo. 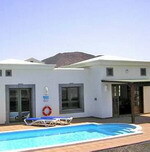 This villa has been decorated to a very high standard, as you will see from the photos. Our work takes us to Fuerteventura a few times a year and we bought this villa with the intention of keeping it for or own personal use, but now that I have just completed the decoration it seems a shame to leave it empty. You will find everything you need to enjoy your stay, the sitting room has high ceilings with two ceiling fans, two large sofas, 40 inch flat screen TV, DVD player and surround sound home cinema. We have a large selection of movies for you to choose from if you fancy a relaxing night in and a great selection of music cds. The living room has a lot of light with double doors opening out to the terrace, window facing the front of the villa and single glass door facing the terrace. Sleeps 6. Superbly appointed two bedroomed villa set in prestigious development with extensive views over the 'Straits de la Bocaina' and beaches of north Fuerteventura. Villa Bocaina is on the front line of a unique development set in 400 acres of rugged natural beauty. It’s situation, on the north coast of Fuerteventura, midway between Corralejo and El Cotillo, affords it immediate access to the most unspoilt and spectacular coastline and stunning volcanic landscape in the Canary Isles. The villa is named after the extensive views it affords, across the Straits of la Bocaina, with Lanzarote clearly visible and less than half an hour by boat. Situated less than 50 miles from Saharan Africa, Fuerteventura has a subtropical climate similar to that of Florida and Mexico. With sunshine all year around, warm, crystal clear water and over 150 sandy beaches, Villa Bocaina is the perfect destination for those who want to escape the package holiday experience, and get to know the real Fuerteventura. Sleeps 6. Villa Bouganbilla is a luxury villa within a unique private gated community. Each of the 3 bedrooms has its own en-suite facilities and the large lounge/dining room leads out into the enclosed courtyard garden with its private swimming pool. The landscaped pool area and the full roof-terrace combine to create areas that are beautiful and functional, whilst inside the clever design makes use of every square foot, thus giving spacious living areas. Wifi service is included in the price. The main street stretches for over a mile from the Baku Water Park down to the Harbour and Marina area. Dotted all along both sides is a vast and varied array of bars, restaurants and shops that caters for all tastes. A leisurely stroll through the harbour area at anytime is a must with spectacular views across to Los Lobos and Lanzarote. The beaches and sand dunes are just outside the main resort and are ideal for swimming, surfing or simply soaking up the sun. Sleeps 6. Villa Margareta is a new detached luxury private villa, Ideal for kids, located within walking distance of the centre of the resort of Corralejo. The villa is ultra modern and is everything and more you could imagine. Set in a peaceful location with views of Lanzarote, the sea and surrounding mountains and is perfect for a relaxing holiday in the wonderful climate of Fuerteventura. The villa is equipped to the highest standard with everything you could imagine, here is a list of a few to mention: • Private garden with private heated pool & gas BBQ, the entire pool area has been grassed; this is fantastic for kids, no more slipping on wet tiles. • Fully-equipped kitchen & utility room (dishwasher, washing machine, dryer, iron & board etc) • Spacious lounge (air con, TV with Sky Sports & Movies, DVD player with over 50 DVDs, ipod docking station, board & card games) Heated outdoor patio dining area and awning with comfy seats • Large roof terrace with dining area (& double outdoor bed!) • 2 Mountain bikes Sleeps 8. Gran Canaria (in English, "Grand (or Great) Canary") is an island of the Canary Islands. Located in the Atlantic Ocean about 150 kilometers (93 miles) off the northwestern coast of Africa and about 1350 km (~838 miles) from Europe. Gran Canaria is the second most populous island of the Canary Islands after Tenerife. Gran Canaria is also the third in extension Canary Islands. Gran Canaria is located southeast of Tenerife and west of Fuerteventura. The island is of volcanic origin, mostly made of fissure vents. Gran Canaria is the most populous island of the Canary Islands. Stunning sea and dune views. 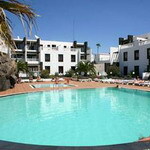 Apartment in very quiet complex of only 21 private owners, heated pool and direct access to the beach and promenade. This apartment offers a haven of tranquility in the centre of a major beach resort which offers activities to suit all tastes, keeping everyone happy through day and night. It is a perfect option for couples who seek a peaceful and relaxing holiday, or those who want somewhere quiet to withdraw to when beach life finishes for the day and the cooling evening breeze blows gently from the sea, as you sit on your balcony overlooking the pool. The building contains only about 20 apartments, all privately owned and used by a few permanent residents and second home owners. Sleeps 3. The apartment is a one bedroom property on the main road, Avenida de Tirajana, in Playa del Ingles suitable for up to four persons. It has been fitted out both to suit to suit both short and long stays Those little extras you always have to carry with you when staying at the typical resort should already be in place for you. The bedroom is furnished with a double bed so no more falling down the gap between mattresses! There is a fitted wardrobe and a dressing table built in too. Further sleeping accommodation is available in the living area in the form of a double sofa-bed. The living area will seat you comfortably and provides a television as well as a DVD player and hi-fi. To the other side of the room is a dining table which is adjacent to the american style kitchen and breakfast bar. Sleeps 4. Luxury two bedrooms, in a quiet community. Sleep max 4. Kitchen fully equipped. Satellite TV . Shared swimming pool with Jacuzzi. Large terrace and common BBQ area. The apartments have been completely restructured in such a way to remark the already existing canarian architectonic style. Each apartment has: two bedrooms (one double and one single bed), bathroom with shower, wide living-room with kitchen equipped with electric cooking rings, refrigerator and micro-waves. Sofa-bed, satellite TV, radio CD, furnished large terrace. Maximum capacity 4 guests . Extra bed not available. Sleeps 4. A newly refurbished property, this 3 bedroom apartment offers the perfect location for a family sunshine holiday. 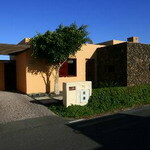 Literally a stones throw from the beach at Maspalomas, it is also close to shops, restaurants and other facilities. Offering 3 bedrooms (one double, one twin and one single) and 2 bathrooms (one en-suite) there is room for 5 guests. The combined living / dining area is spacious with a wide balcony and views over towards the beach and sea. 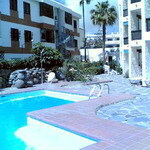 The apartment is fitted with a fully equipped kitchen with oven, hob and dishwasher. All crockery and implements are provided for your use. A washing machine is also available. Bedlinen and towels are provided and will be changed weekly during your stay. The living area and two main bedrooms are air-conditioned and balconies adjoin those rooms as well. Welcome packs of food can be arranged as can transfers to and from the airport. Sleeps 5. The short answer is "It can offer you anything and everything", but surely you want to know more? This spacious 2 bedroom penthouse frontline apartment is privately owned and has recently been completely redecorated. 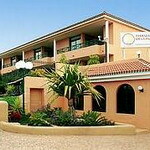 It has stunning views over the Atlantic and the mountains in the south of the island and Fuerteventura. Evening is a special time of the day and the sunsets are quite spectacular. The apartment boasts being centrally located (in between the New and Old Town of Puerto del Carmen) and just meters from the beach in a complex set within well-maintained gardens throughout. The master bedroom has a Queen bed, built-in wardrobes, dressing table and chair. The second bedroom has two single beds, built-in wardrobes, dressing table, chair and both bedrooms have sea views. The lounge opens onto a large terrace area comprising of patio table and 4 chairs. Sleeps 5. 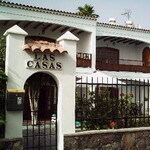 Casa las Anclas is situated in the heart of Playa Blanca, 50 metres from the promenade, less than two minutes walk from the nearest beach and placed just moments away from a wide range of excellent shops and restaurants. This includes the excellent Cafe 34 situated below, which provides good value English meals and a nice friendly atmosphere. The apartment is extremely well equipped. It has one double bedroom and one twin bedded room, and with a sofa bed in the lounge it offers sleeping for up to 5. The apartment has SKY TV, a DVD and a Playstation together with a selection of films, CDs and games for guests' use. The lounge and each bedroom have ceiling fans. The kitchen is fully equipped. The apartment offers superb views from its large roof terrace, which also includes a barbecue, table and chairs, and 4 sunbeds. Sleeps 5. 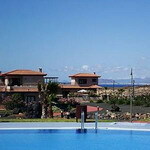 The villa has panoramic views of the sea and surrounding beauty as it is a front line property. Just a short stroll of 150m will bring you to the waters edge. There is a pedestrian walk along the coast that bring you into the center of playa blanca. There are some lovely eateries and shops to stop at along the way. The villa is located in a very quiet area of Playa Blanca but is only a 4 minute walk to a group of shops that include a Supermarket, Bar, Chinese & Bistro. The private electrically heated swimming pool (8m x 4m) is just outside the bedroom making any early morning splash very enticing! This area is residential and so is very quiet. The villa is completely detached so there are no fears of the clank of neighbours shoes whilst you are sleeping! The Villa has an Air Conditioning Unit. A large private al-fresco dining area with panoramic views of the sea and views of neighbouring islands. The private swimming pool measures 8m x 4m and is heated to a constant temperature. The pool is private and is not overlooked. Sleeps 5. 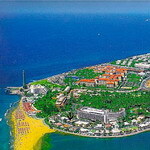 Tenerife, a Spanish island, is the largest of the seven Canary Islands in the Atlantic Ocean off the coast of Africa. Tenerife has an area of 2034.38 square kilometers, and 899,833 inhabitants. It is the most populated island of the Canary Islands and Spain. About 42% of the population of the Canary Islands housing on this island, this is almost half the total population of the archipelago. About five million tourists visit Tenerife each year, which is also one of the busiest Spain resorts and the first of Canary Islands. Tenerife also has one of the world's largest carnivals, and the Carnival of Santa Cruz de Tenerife now aspires to become a World Heritage Site. The island hosts in its capital the architectural symbol of the Canary Islands, the modern Auditorio de Tenerife which is also one of the main buildings of Spanish architecture. Tenerife is the only Spanish island that has two airports and two ports (the others have only one port and one airport each), which makes Tenerife the most interconnected in Spain. Santa Cruz de Tenerife is the capital of the island and the seat of the island council (cabildo insular). The city is capital of the autonomous community of Canary Islands (shared with Las Palmas), sharing governmental institutions such as Presidency and ministries. Between the 1833 territorial division of Spain and 1927 Santa Cruz de Tenerife was the sole capital of the Canary Islands, until in 1927 a decree ordered that the capital of the Canary Islands be shared, as it remains as at present. The island is home to the University of San Fernando de La Laguna, which was founded in 1792. The University of La Laguna is the oldest university in the Canaries. San Cristóbal de La Laguna (World Heritage Site) is the second city of the island and the third one of the archipelago. The city of La Laguna was also capital of the Canary Islands until Santa Cruz replaced it in 1833. Tenerife also has the highest elevation of Spain, a World Heritage Site that is the third largest volcano in the world from its base, El Teide. Exceptionally spacious this luxery 2 BED 2 BATH bungalow is on a complex with 4 swimming pools, a fantastic restaurant and has a large terrace and private roof terrace. The Palms gets is name from the number of palm trees and gardens that have been planted around this complex giving very a picturesque experience. The walk ways are line with shrubbery and plants. The bungalow is exceptionally spacious with 2 double bedrooms, sleeping up to 4 adults comfortably. The lounge has 2 luxUry leather sofas, satelitte tv (BBC1, BBC2, ITV, CH4, CH5) , DVD, stereo cd system and a dining table and chairs. The kitchen is separate from the living room. The main bedroom has ensuite shower facilities and is furnished with a double bed. The 2nd bedroom is also of double size with 2 twin beds and fitted wardrobes. Sleeps 4. Privately owned apartment in thriving and highly sought after complex. 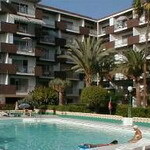 Parque Santiago is one of the most popular complexes in the area of Las Americas, Tenerife. Having long been established as one of the most sought after complexes it benefits from a wonderful beach front location and is only a few minutes walk from some of the more exclusive areas in Las Americas. Having a privately owned apartment to rent in Paque Santiago is very rare and although its brand new on our books, this duplex is already proving to be very popular. This apartment is quite unique. The bedroom is upstairs and therefore completely separate from the main living area. However, there is a small yet separate room off the main bedroom where a single bed is situated, meaning the 3rd person also has his / hers own bedrooom too! With a double sofa bed in the living room this apartment can sleep up to 4 people Sleeps 4.